For the first 4 listed, I'm reasonably sure I've got the ratios correct (which means I've been able to confirm from multiple sources). However for Snowpeak I've seen different ratios claimed, and I can't find any info on the Jetboil canisters. Anybody know these ratios definitively? Anybody care to share what their experiences are with regards to the lowest temps that they have used various brands of canisters down to (and still gotten good results)? I'm looking for inverted use especially. Thanks! I've got no info to offer, but do have a question: theoretically/practically, what ratio would go down to the lowest temps? I'm not familiar enough with the effect of different blends to know what a best ratio might be. But I'd love to see the results of this thread as winter rolls in and I'm still using a canister stove for most of my trips. Isobutane boils lower than N-butane so it would seem the best mix would be Isobutane and propane. What the optimum is I don't know. Coleman Powermax seems to be the best fuel but those only fit the Coleman Xpert and Xtreme stoves (now out of production). Their customer service was good enough to inform me that the gold canisters are 85% isobutane, 15% propane. Avoid their silver canisters. 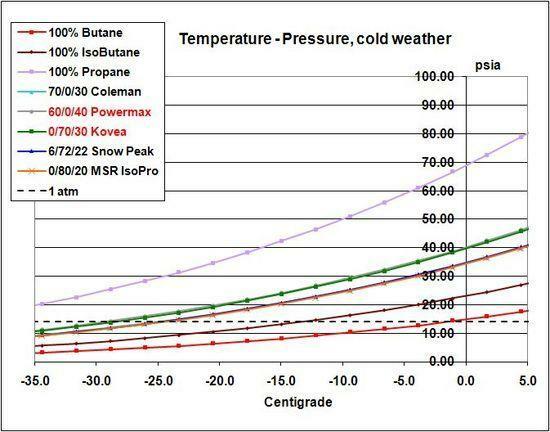 Here is a graph I made which shows the boiling point (C) of 3 different mixtures (Coleman and Primus as above, and a hypothetical 20% propane, 80% i-butane) when the canister is used UPRIGHT. This shows how the boiling point rises as the propane is used up first. Remember, boiling point is the temp at which the total vapour pressure matches sea-level atmospheric pressure; the canister needs to be at least 5C above the boiling point for there to be sufficient pressure to operate the stove. When the canister is used INVERTED, the propane/butane mix does not change and so the boiling point remains constant at the value on the temp axis. In this case, all three mixtures are almost identical! Actually, as far as I can see, the fuel mixes sold by the different companies vary from year to year and country to country. Most confusing. Anyhow, the limiting factor is the pressure inside the canister at 50 C (DOT regulations). Some examples are as follows. This needs some explanation of course. First of all, the compositions shown here may have changed over the years. Second, the pressures are absolute, and you will only get gas out while the pressure exceeds 1 atmosphere – the dashed line. Third, what's currently available in America may differ from what is available in Australia. The pure propane has too much pressure for the conventional screw-thread canister. But Coleman do sell a stronger steel canister with a different fitting. If you want to go pulking at -40 C, that's the way to go. The Kovea 70% isobutane / 30% propane curve overlays the Powermax 60% butane 40% propane curve. These were the best performing brands available in Australia at the time. Both are pushing the pressure limit for the canisters. The MSR 80% iso-butane / 20% propane overlays the Snow Peak mixture – which may have changed. I suspect the Coleman 70% n-butane / 30 $% propane matches (is under) these two as well. Any other mixes will be below the performance of the Powermax, regardless of the mix. Pure iso-butane and pure butane are also shown. They are a bit feeble! The boiling point stays more or less constant if the canister is used inverted (you know that :-) my graph attempts to explain what happens when the canister is used upright. It took a bit of effort with a spreadsheet to work this out. I just took a look at the Cascade Designs (MSR) and Snow Peak web sites (see below). It does look like Snow Peak has changed their blend. Dimensions – D 3.25" H 2.5"
Clean-Burning: Optimal fuel blend results in reduced soot and clogs. Recyclable: Canisters can be recycled. Consult your local recycling center for regulations. Well, 6.4oz does not equal 110g in weight. So, I thought maybe they meant 6.4oz (gross weight) for 110g (net weight), but 6.4oz seems on the light side. Maybe it is 6.4 fluid ounces. >> Anybody care to share what their experiences are with regards to the lowest temps that they have used various brands of canisters down to (and still gotten good results)? I'm looking for inverted use especially. Thanks! My son and I just took a two day trip where temps in the evening and morning were a steady 35F. We were using a Snowpeak Litemax stove with a MSR pancake canister and a Snowpeak gold mini. The MSR failed everytime after about 90 secs. The only way I could get it to perform was to wrap it in a fleece and put it in my foot box during sleep each night. The Snowpeak worked everytime we whipped it out. I could have gotten a bum MSR canister, but that was our experience with the two at 2500ft, 35F, and using a Litemax. Hunh. That's weird. Were they both fresh canisters? Actually the Snowpeak was older than the MSR. I'm going to do some testing on my deck this week. I have another MSR canister to use with the other two and try to find out what was up with the situation. Let us know what you come up with. That's really weird that MSR gas would flop while Snow Peak would shine. MSR should be slightly better in cold weather, just judging by their advertised fuel ratios. I wonder if it could be down to differences in the dimensions of the canister fitting – the flange and the Lindal valve, such that in the case of the MSR canister the pin on the stove is not fully opening the Lindal valve. This can also happen with the MSR Pocket Rocket when that big rubber washer goes hard in the cold. Good thought. I had an Optimus Crux that inexplicably died part way into a boil. I tightened up the canister, and it was fine. Any reason for this? Steel bottle so heavy that benefits are outweighed? That heavy steel bottle can be refilled. Everything can be refilled. Butane-mix canisters can be refilled from larger canisters for some cost savings. 16-ounce propane cylinders can be refilled VERY inexpensively from bulk (BBQ) propane tanks – about $0.70 per refill in my town. Versus $8-9 for a 450-gram butane canister (same BTUs) or $20 for four 110-gram canisters (same BTUs). Now, those propane cylinders aren’t supposed to be transported across state lines if refilled, but I live in a large state. Keep in mind that there are lots of safety issues to be aware in any refilling. As to the point of that “propane JetBoil”? Great cold-weather performance, moderate price fuel without refilling and very cheap with refilling. So if you are more price-sensitive and go out below -20F a lot, and aren’t weight sensitive (car camping, horse packing, sledding out for ice fishing, snowmobiling, etc) it seems like an intriguing option. But for backpacking? Nope. Learn to refill from larger butane canisters (or cheaper n-butane canisters) to save money and learn to use a Moulder Strip for sub-0F use. Not quite what I meant. You cannot legally refill the canisters we use – even if so many of us do. They are strictly single-use. But you can take a steel propane cylinder to the nearest gas dealer and have it refilled with propane or LPG. Well – you can in Australia anyhow. The difference is to be found in the connection. The Lindal valve in our canisters has an absolutely crappy half-formed thread in sheet steel (which rusts), while the propane cylinder has a proper threaded-brass connector. Not sure how applicable this is to the rest of the world but in Japan the parent company of Soto sells this Lindal valve canister for their brazing/welding/kitchen torches. Certainly not lightweight at 410g yielding 220g of 57/43 butane/propane. Cheap though. I just cant think of a situation where I’d need straight propane, but only want a jetboil style vessel. Plus the weight of the bottle throws it all on its head. When dog mushers only have a 10 minute coffee break? Maybe ski patrollers on snow machines? Propane boiling point is -44 F. Straight propane would be good as you get close to that temperature. Cook you up some noodles on top of Mt Everest dudes. This reply was modified 1 year, 4 months ago by John S.. If it was April 1st, I’d post about a 4 ounce, 115-gram aluminum propane tank. Only $13.99. And it really is available (but there’s one catch).